The culture of Sri Lanka has been influenced by many factors but has managed to retain much of its ancient aspects. Mostly it has been influenced by its long history and its Buddhist heritage. The country has a rich artistic tradition, embracing the fine arts, including music, dance, and visual arts. Sri Lankan lifestyle is reflected in the cuisine, festivals, and sports. South Indian influences are visible in many aspects. There are some influences from colonisation by the Portuguese, the Dutch, and the British. Sri Lankan culture is best known abroad for its cricket, food, holistic medicine, religious icons like the Buddhist flag, and cultural exports such as tea, cinnamon and gems. Sri Lankan culture is diverse, as it varies from region to region. Sri Lanka has had ties with Indian subcontinent from ancient times. Demographics: Sinhalese 74.8%, Sri Lankan Moors 9.23%, Indian Tamil 4.16%, Sri Lankan Tamil 11.21%, Other 0.6%. Sri Lanka boasts of a documented history of over 2000 years mainly due to ancient historic scriptures like Mahawansa. Several centuries of intermittent foreign influence, has transformed Sri Lankan culture to the present outlook. Nevertheless ancient traditions and festivals are celebrated by mostly conservative Sinhalese people of the island, together with other minorities that make up the Sri Lankan identity. The architecture of Sri Lanka displays a rich variety of architectural forms and styles. Buddhism had a significant influence on Sri Lankan architecture. However techniques and styles developed in Europe and Asia have also played a major role in the architecture of Sri Lanka. Many forms of Sri Lankan arts and crafts take inspiration from the Island&#39;s long and lasting Buddhist culture which in turn has absorbed and adopted countless regional and local traditions. In most instances Sri Lankan art originates from religious beliefs, and are represented in many forms such as painting, sculpture, and architecture. One of the most notable aspects of Sri Lankan art are caves and temple paintings, such as the frescoes found in Sigiriya and religious paintings found in temples in Dambulla and Temple of the Tooth Relic in Kandy. Other popular forms of art have been influenced by both natives as well as outside settlers. For example, traditional wooden handicrafts and clay pottery are found around the hill country while Portuguese-inspired lacework and Indonesian-inspired Batik have become notable. The two single biggest influences on Sri Lankan music are from Buddhism and Portuguese colonizers. Buddhism arrived in Sri Lanka after the Buddha&#39;s visit in 300 BC, while the Portuguese arrived in the 15th century, bringing with them cantiga ballads, the ukulele, and guitars, along with African slaves, who further diversified the musical roots of the island. These slaves were called kaffrinha, and their dance music was called baila. Traditional Sri Lankan music includes the hypnotic Kandyan drums – drumming was and is very much a part and parcel of music in both Buddhist and Hindu temples in Sri Lanka. Most western parts of Sri Lanka follow western dancing and music. The cinematic style is similar to the Bollywood movies. In 1979, movie attendance rose to an all-time high, but recorded a gradual downfall since then. Undoubtedly, the most influential and evolutionary filmmaker in the history of Sri Lankan cinema is Lester James Peiris, who has directed a number of movies which led to global acclaim, including Rekava (Line of destiny, 1956), Gamperaliya (The changing village, 1964), Nidhanaya (The treasure, 1970), and Golu Hadawatha (Cold Heart, 1968).There are many cinemas around Sri Lanka in city areas. The cuisine of Sri Lanka draws influence from that of India, especially from Kerala, as well as colonists and foreign traders. Rice, which is usually consumed daily, can be found at any special occasion, while spicy curries are favourite dishes for lunch and dinner. A very popular alcoholic drink is toddy or arrack, both made from palm tree sap. Rice and curry refers to a range of Sri Lankan dishes. Sri Lankans also eat hoppers (Aappa, Aappam), which can be found anywhere in Sri Lanka. Much of Sri Lanka’s cuisine consists of boiled or steamed rice served with spicy curry. Another well-known rice dish is kiribath, meaning milk rice. Curries in Sri Lanka are not just limited to meat or fish- based dishes; there are also vegetable and even fruit curries. A typical Sri Lankan meal consists of a “main curry” (fish, chicken, or mutton), as well as several other curries made with vegetable and lentils. Side-dishes include pickles, chutneys and “sambols” which can sometimes be fiery hot. The most famous of these is the coconut sambol, made of scraped coconut mixed with chilli peppers, dried Maldivian fish and lime juice. This is ground to a paste and eaten with rice, as it gives zest to the meal and is believed to increase appetite. In addition to sambols, Sri Lankans eat “mallung”, chopped leaves mixed with grated coconut and red onions. Coconut milk is found in most Sri Lankan dishes to give the cuisine its unique flavour. Many of Sri Lanka’s urban areas are host to American fast food corporations and many of the younger generation have started to take a liking to this new style of cuisine although it is rejected by many, particularly the more traditional elder members of the community. Sri Lanka has long been renowned for its spices. The best known is Cinnamon (Cinnamomum verum/ Cinnamomum zeylanicum) which is native to Sri Lanka. In the 15th and 16th centuries, spice and ivory traders from all over the world who came to Sri Lanka brought their native cuisines to the island, resulting in a rich diversity of cooking styles and techniques. Lamprais rice boiled in stock with a special curry, accompanied by frikkadels (meatballs), all of which is then wrapped in a banana leaf and baked as a Dutch-influenced Sri Lankan dish. Dutch and Portuguese sweets also continue to be popular. British influences include roast beef and roast chicken. The influence of Indian cooking methods and food has played a major role in what Sri Lankans eat. Sri Lankans use spices liberally in their dishes and typically do not follow an exact recipe: thus, every cook&#39;s curry will taste slightly different. Furthermore, people from different regions of the island (for instance, hill-country dwellers versus coastal dwellers) traditionally cook in different ways. Sri Lankan cuisine is known to be among the world&#39;s spiciest, due to the high use of different varieties of chilli peppers referred to as amu miris (Chili pepper), kochchi miris, and maalu miris (Banana pepper) (capsicum) and in Tamil Milakaai, among others. It is generally accepted for tourists to request that the food is cooked with a lower chilli content to cater for the more sensitive Western palette. Food cooked for public occasions typically uses less chilli than food cooked in the home, the latter where the food is cooked with the chilli content preferable to the occupants. The Sinhala and Tamil New Year (“Aluth Avurudhu”; in Sinhala, “Puthiyathandu”; in Tamil) is a very large cultural event on the island. The festival falls in April (also known as the month of Bak) when the sun moves from the Meena Rashiya (House of Pisces) to the Mesha Rashiya (House of Aries). Unusually, both the end of one year and the beginning of the next occur not at midnight but at separate times determined by astrologers with a period of some hours between (the “nona gath”; or neutral period) being a time where one is expected to refrain from all types of work and instead engage solely in relaxing religious activities and traditional games. During the New Year, festivities both children and adults will often don traditional outfits. But the clothes must be washed and very clean because it should be southam (pure). Sinhala is spoken by about 16 million people in Sri Lanka, about 13 million of who are native speakers. It is one of the constitutionally-recognised official languages of Sri Lanka, along with Tamil, which has its origins in South India. Most Sri Lankans can speak English, though of course, their brand of English may sound a bit strange at first. Some struggle with English and that is sometimes due to a lack of confidence. Just enjoy the experience, if you can learn a little of Sinhala. The Sinhalese will go out of their way to help you because you have gone out of your way to learn their language, their most cherished possession and symbol of identity. 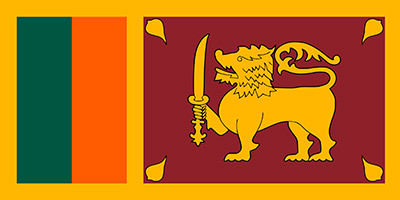 The flag of Sri Lanka, also called the Lion Flag, consists of a golden lion holding a kastane sword (short traditional ceremonial/ decorative single-edged sword) in its right front paw, in front of a dark red background with four golden bo (species of fig native to Sri Lanka) leaves, one in each corner. Around the background is a yellow border, and to its left are vertical stripes of equal size in green and saffron, with the saffron closest to the lion. The lion represents the Sinhalese ethnicity and the bravery of the Sri Lankan nation while the four Bo leaves represent Metta (loving kindness), Karuna (compassion), Mudita (joy) and Upekka (equanimity). The orange stripe represents the Sri Lankan Tamils, the green stripe represents Sri Lankan Moors, and the maroon background represents the majority of Sinhalese, like the lion, this is the colour used in early flags of Sri Lanka by kings. Apa hata sapa siri setha sandana, jeevanaye Matha! Sri Lanka’s culture revolves around religion. The Buddhist community of Sri Lanka observe Poya Days, one per month according to the Lunar calendar. The Hindus and Muslims also observe their own holidays. Sri Lankans are very religious, the history of the island has involved many people arriving and introducing their beliefs. There are many Buddhist temples in Sri Lanka associated with ancient times. The religious preference of an area could be determined by the number of religious institutions in the area. The North and the East of the island has several notable Hindu temples due to the majority of the Tamil population residing in these areas. Many churches can be found along the southern coastline because of former Roman Catholic or Protestant colonial heritage. Buddhists reside in all parts of the island especially down south, up country and the western seaboard. Sport plays a very big part in Sri Lankan culture. Every child in Sri Lanka knows how to play cricket, and there are many cricket fields scattered across the island for children and adults to play the sport. The biggest pastime of the Sri Lankan population, after cricket, is watching the Sri Lankan national team play cricket. It is common for businesses to shut down, when very big matches are televised. This was the case in 1996, when the Sri Lankan team beat Australia in the finals to win the Cricket World Cup. The whole country was shut down, although there was a curfew imposed upon the whole island.